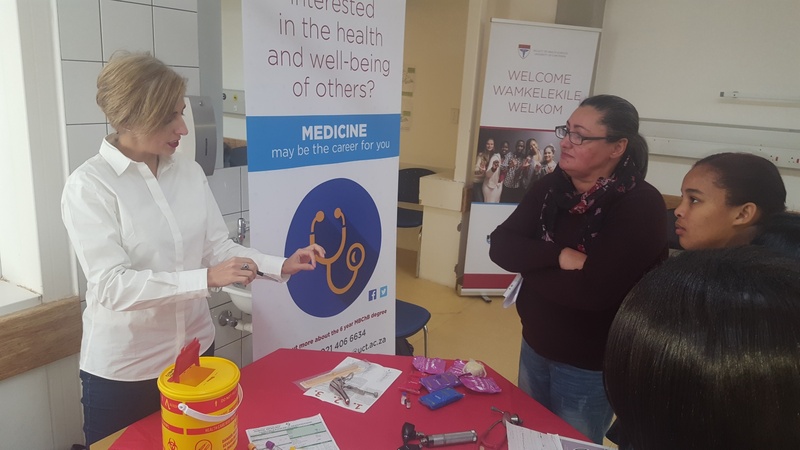 The Faculty of Health Sciences, under leadership of the Primary Health Care Directorate, and in collaboration with the WCG - Saldanha Bay Health Sub-district, hosted an Open Day at the Vredenburg Hospital on 26 July 2018. This was the second year that this event was held to showcase Health Science professions to G11 and G12 learners in the area. The event was planned in consultation with Mr Avril Daniels (the Department of Education: West Coast Circuit Manager), Dr Silvio Morales-Perez, CEO of Vredenburg Hospital as well as staff from the Health sub-district. This initiative was welcomed by the local Principals and the Life Orientation teachers as it allowed learners to interact with a range of health professional staff and students. Dr Silvio Morales-Perez, CEO of Vredenburg Hospital, opened the event and welcomed at the guests. He stressed the importance of days like these and emphasised that learners should use the opportunity to inform themselves of the various fields of studies they could pursue. Mr Dehran Swart, Health Teaching Platform Manager, welcomed everyone on behalf of: Director of PHCD, Prof Reid, the Dean, Prof Mayosi and the VC, Prof Phakeng. He emphasised the numerous accolades the University and Faculty of Health Sciences had achieved over the years. Five schools represented by 28 learners in total then rotated through the various stalls. Practical activities were incorporated into the different stalls where the use of clinical equipment was demonstrated. An interest in job shadowing was immediately sparked by learners who visited the stalls. The rotations were concluded with a visit to the Emergency Medical Services where paramedics briefed learners about ambulances and their work during emergencies. Educators and learners were very appreciative of the opportunity to attend the Open Day. A teacher reported that all her Gr 12’s who attended last year’s event, applied for admission to an institution for higher education for one of the careers exhibited. UCT will continue to pursue other departments in the health field to partake in future Open Days such as the renal unit and laboratories. Dr Visser, UCT’s Family Physician, extended a vote of thanks to all participants and attendees. A special thanks was extended to Sandra Adams, UCT’s Site Co-ordinator based at the Residence/Learning Centre in Vredenburg.